Retomar sonidos [Take Back Sounds] – a visual-sound piece realized in CMS phase 2 – won the first prize at Amposta Biennal – BIAM 2018. A jury composed by Juan Canela (independent curator and co-founder of Bar Project); Núria Enguita (Director of Bombas Gens Art Center – Valencia); Alexandra Laudo (art critic and independent curator); Martí Manen (art critic and independent curator) and Manel Margalef (Director of Lo Pati Art Center) selected Retomar Sonidos as a winner art piece keeping in mind the quality of the work and the social sensitivity that comes up. The exhibition will be opened until July 29th. Retomar sonidos [Take Back Sounds] – a visual-sound piece realized in CMS phase 2 – will be showed in Amposta (Spain) within the framework of Amposta Biennal, an exhibition curated by Centre d’Art Lo Pati. A jury composed by Juan Canela (independent curator and co-founder of Bar Project); Núria Enguita (Director of Bombas Gens Art Center – Valencia); Alexandra Laudo (art critic and independent curator); Martí Manen (art critic and independent curator) and Manel Margalef (Director of Lo Pati Art Center) selected the 17 art pieces that will be exhibited in the biennal, between them Retomar Sonidos. Opening June 16th, 2018 at 7 PM. The exhibition will be opened until July 29th. Il progetto ‘Cooking in Maxim Security’: fare ricerca in carcere attraverso un laboratorio di arte visiva. Retomar sonidos [Take Back Sounds] – a visual-sound piece realized in CMS phase 2 – will be show in Jakarta within the framework of Ok Video – Indonesia Media Art Festival running from July 22nd until August 16th. Opening July 22nd, 2017 at 7 PM – RURU Gallery, Gudang Sarinah Ekosistem Jl. Pancoran Timur II No. 4, Jakarta. CMS project is collaborating with COCINA DE GUERRILLA. The first activity will be run in Madrid in plaza Jacinto Benavente on Saturday 3 of june, from 12 to 8.30 PM. Cocina de guerrilla is a cooperative project that refocuses the cuisine and the gastronomy, its knowledge, techniques and capacities towards the satisfaction of the basic alimentary necessities of all the people, promoting the food sovereignty like guarantee of the alimentary and human rights. Matteo Guidi has been interviewed from Pilar Sampietro from Radio4 rne about kitchen practices in penitentiary and other new projects related to food and closed context. listen the program here. [Intro about Matteo Guidi and his work at minute 1 and all the interview (in spanish) from minute 23.50]. Matteo Guidi will hold a speech with title Practicas de cocina en contexto penitenciario: dos casos en comparación [Cooking practices in penitentiary context: two cases in comparison] during the Irun Open Innovation 2016 (Irun, Spain). Here the entire program of the event. A collaboration between CMS project, Istituto alberghiero Santa Marta (Catering Institute) and Casa Circondariale di Pesaro (Pesaro Penitentiary) has generated an event composed by a lunch and a debate. The lunch will be a selection of recipes from CMS publication and prepared by students of the Institute Santa Marta with the kitchen utensils made by the inmates of the Pesaro penitentiary. Following there will be a reflection on the theme of everyday life in Italian prisons with the presence of Matteo Guidi the director of the Penitentiary and other people involved in this collaboration. Retomar sonidos [Take Back Sounds] – a visual-sound piece realized in CMS phase 2 – will be show in Medellín (Colombia) within the framework of Lo que no se cura se pudre, an exhibition curated by Por Estos Días collective. Opening August 11th, 2016 at 7 PM – Cra 38 # 26-385, Medellín-Colombia. Matteo Guidi has been invited to present CMS project in the framework of Culturas 2016 – from 6.30 PM to 8 PM at CaixaForum Barcelona. CMS phase 2 is completed! Matteo Guidi has held a cycle of workshops with a group of women detained within the DONES U sector of BRIANS 1 Penitentiary (Catalonia, Spain). The results will soon be presented in Food Cultura Satellite BQ located in the Boqueria Market of Barcelona. Matteo Guidi will hold a workshop-talk within the framework of Passavamo sulla storia leggeri, a cycle of events curated by Antonia Alampi and Jens Maier-Rothe taking place at the Cagliari Museum of Modern Art at 3 pm as part of Cagliari Capital of Italian Culture 2015.
is the title of an article written by Gianluca Pozzoni and Alberto Mucci for Munchies in VICE magazine. The article also includes interviews with people involved in the process. Matteo Guidi will hold a talk within the framework of Ús Barcelona – festival d’art i d’espai públic (Festival of Art and Public Space) – 4 pm, Carrer Pere IV, 179, Barcelona. Within the framework of Fuori e dentro: un altro sguardo sul carcere (Outside and In: Another Look into Prisons, Matteo Guidi is invited to present the book La dolce evasione: ricette dal carcere (The Sweet Escape: Recipies from Prison) penned by Gazmend Kullau. Matteo Guidi is invited to present the CMS research within the framework of the Anthropology and Psychology of Food and Gastronomy course held by professor Joan Ribas. One year after its first release, CUCINARE IN MASSIMA SICUREZZA was sold out. Now it has been reprinted and is available in italian bookshops and online book sellers. Matteo Guidi will present the Cooking in Maximum Security research (Italian phase) within the framework of the VIII JORNADA DE MONITORS ARTÍSTICS DE CENTRES PENITENCIARIS (DAY OF ARTISTIC MONITORS OF PRISONS) in the Center for Juridical Studies and Specialized Training of Generalitat of Catalunya (Catalunya Government). CMS book and CMS silkscreen prints (A folder containing six 24 x 33 cm prints based on the original drawings of Mario Trudu) will be in ARCOmadrid International Contemporary Art Fair with Múltiplos Books (Barcelona). Matteo Guidi is Espai Nyam Nyam‘s (Barcelona) invited researcher for the month of January. The results of the work in progress will be presented every Thursday from 2 PM to 3 PM. For more information or to reserve a place contact Nyam Nyam here. CMS is excited to announce a limited edition of silkscreen prints! 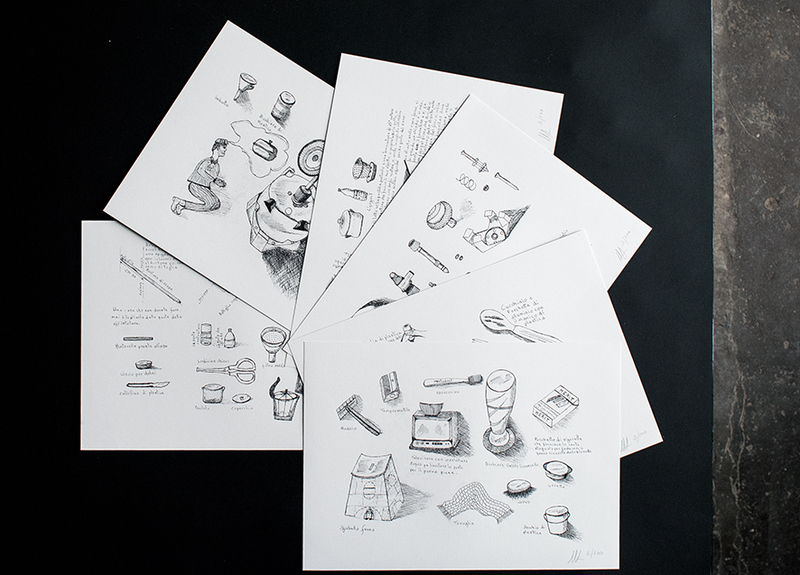 A folder containing six 24 x 33 cm prints based on the original drawings of Mario Trudu is now available for purchase. Each print in the series is numbered from 1 to 100 and signed by artist-director of the CMS project. For more information about the CMS silkscreen print folder, please contact CMS staff or (galleria +) oltredimore. Your contribution will help CMS thrive! CMS in Quatre Camins Penitentiary – Barcelona. This month, a group of inmates from the penitentiary Quatre Camins dedicated their programme CUINA MIX to CMS. The audio file is available in the Universo Cultural Magazine, where it is possible to listen to the broadcast (starting from 15’35”). CMS in Mirus Magazine, Issue 01. The first issue of the new Swiss online magazine Mirus dedicates a section to CMS. Matteo Guidi will discuss the book Cucinare in Massima Sicurezzawith Rolando d’Alessandro (writer and activist). Matteo Guidi will present the Cooking in Maximum Security research within the framework of the XXI DAYS OF PhD STUDIES AND RESEARCH OF ODELA (Food Observatory).